Baltimore police commissioner fired: Mayor Rawlings-Blake relieves Batts of duty. 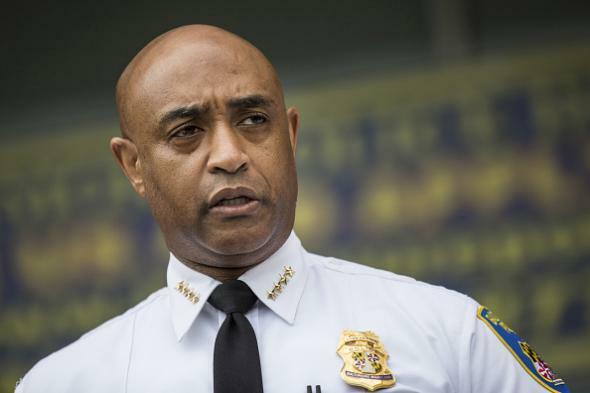 Ex-Baltimore Police Commissioner Anthony Batts. Things are not good in Baltimore right now. Crime is up, citizens are upset with police officers in the wake of Freddie Gray’s death, police officers are upset with city officials’ response to rioting, the mayor is upset with the police union for criticizing city officials’ response to rioting, and city officials are also upset with each other—evidence of the latter dispute having come suddenly to light Wednesday afternoon as police commissioner Anthony Batts was fired by mayor Stephanie Rawlings-Blake just minutes before he was scheduled to give a press conference about the rioting/police union issue. Rawlings-Blake says she chose to terminate Batts because of the city’s recent spike in crime—six people have been killed in Baltimore in the last 24 hours alone while officers have been making fewer arrests in what may or or may not be a coordinated slowdown.. Under even slightly more normal circumstances, her move would not be surprising; Batts is the leader of the group most directly responsible for preventing crime. But Rawlings-Blake’s actions earlier Wednesday had seemed to indicate that she was taking the commissioner’s side after a police union report harshly criticized him for allegedly exposing officers to danger with a riot-response strategy that privileged public relations over safety. A statement from the mayor called the report’s accusations “baseless and false” and said the union’s leaders had “chosen to be their lesser selves” by using divisive rhetoric. At the same time, though, a major group of religious leaders was also preparing to call for Batts to resign—which is to say he had apparently lost the trust of significant portions of two groups (rank-and-file police officers and community organizers) who themselves are often at odds. Rawlings-Blake alluded to Batts’ lack of support in her press conference explaining his firing, calling the “debate” about police leadership a “distraction” from the pressing issue of the crime epidemic.